Huge Savings Item! Free Shipping Included! 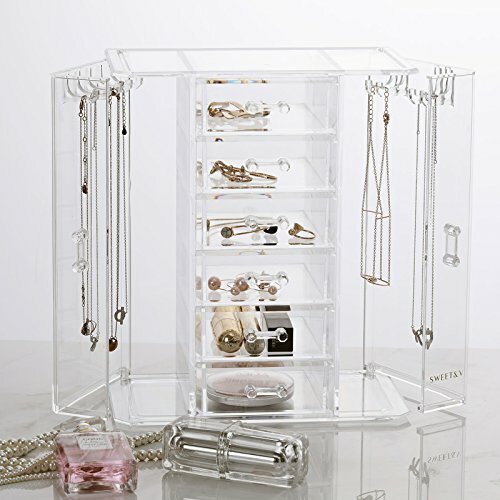 Save 17% on the SWEETV Acrylic Jewelry Storage Box - Cosmetic Makeup Tool Organizer Holder with 6 Drawers & 9 Necklace Hanging Hook by SWEETV at Home Decor Outlet Store. MPN: SVSASSH1802. Hurry! Limited time offer. Offer valid only while supplies last. Your personal space breaks out epiciously Have you taken hours to arrange lipstick and cosmetics you bought from your favorite hairdresser? . Have you taken hours to arrange lipstick and cosmetics you bought from your favorite hairdresser? . SWEETV Jewelry Box is a product to keep all your beauty products and necklaces together. This product will clean up your room and you can organize beauty products smartly. In addition, this product has six drawers, more efficient use of more space. You can also earring earrings with other jewelry. Earrings, necklaces, bracelets, lipsticks, eye shadows, mascaras, accessories, etc. It is an ideal choice to collect various items! It is an honor if it is possible to store your items in the style you like just by using our products! All-purpose and stylish design matches any interior! Because it adopted high-quality acrylic, it makes it easy to clean even if it gets dirty, only warm water is needed. Compared to wooden products, our products have advantages of dustproof and waterproofing, keeping clean tables is much easier. Transparent high quality material makes it easy to locate your beauty products and items, and it will also be easy to clean. Elegant design will touch any atmosphere, anywhere being held. Made of 100% clear acrylic, excellent to keep your dressing table neat and tidy! View More In Decorative Jewelry Boxes. If you have any questions about this product by SWEETV, contact us by completing and submitting the form below. If you are looking for a specif part number, please include it with your message.